This collectible Grateful Dead hat pin is in the shape of the state of Illinois with a 13 point lighting bolt. 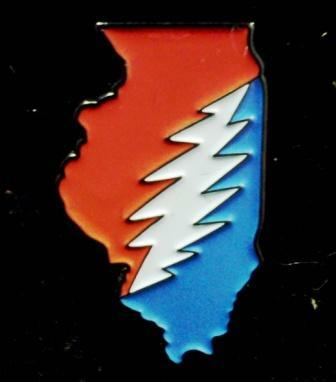 If you're from Illinois and are a deadhead, you'll love this pin. Double posted, about 1 1/4" big. Nice quality Pin. Round plastic stoppers that don't pinch, scratch, or pull out hair. The inlays are bright, with clean lines. 13 points on the bolt. If you want a dope dead pin that reps Illinois, look no further.